In China the tiger is considered to be the king of the beasts and lord of the land animals, much as the lion is in Africa and in European symbolism. The tiger is seen as encapsulating the qualities of courage, power, physical strength and military prowess. It represents both human vitality and animal energy. It is one of the 4 animals associated with the 4 directions, the seasons and the elements. Its stripes represent the double aspects of yin and yang. In Feng Shui the tiger shows its yin side, whereas in Chinese Astrology its yang qualities come to the fore. 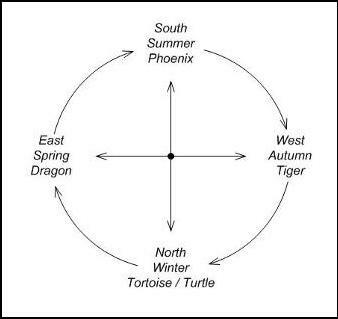 In Feng Shui the tiger is associated with the metal element, the colour white, the season of autumn and the direction of the west. As this is where the sun sets it also represents death, and this is why the tiger is considered to be the Guardian of Graves. In contrast, the east, where the sun rises is the domain of the dragon, creation, birth and the spring. In much Chinese symbolism, the dragon and phoenix are seen as counterparts, whereas in feng shui it is the dragon and the tiger which are seen as balancing aspects of nature, the heavenly and the earthly. Mountains represent the dragon whilst the plains and gently rolling hills are related to the tiger. A favourable location is usually where the dragon and tiger meet. However, it is said that the dragon should be dominant to keep the tiger benevolent. The dragon embodies the creative spirit of nature whilst the tiger represents its physical manifestation. When together, they symbolise the interacting forces of spirit and matter. In Chinese Astrology, the tiger shows its yang nature. If benevolent, it has the power to protect against demons and to give strength and courage. (A tigers tooth hung around the neck is said to protect male virility). These powers have a reflection in the use of the lion on shields and coats of arms in western heraldry. There are Kung Fu systems based around and incorporating tiger like movements. The Indonesian art of Pentjak Silat is said to have been inspired by the movements and qualities of the tiger. On another level, the tiger represents energies which we have to learn to deal with. Gerda Geddes suggests, that in the symbolism of Tai Chi, when you Ride the Tiger it means that you are in control of your energy. When we Embrace Tiger Return to Mountain it means that we have come to terms with our various energies and are ready to return to the stillness of the mountain. In Chinese mythology and artwork, various deities are depicted riding tigers. For a mortal to do so represents the willingness to encounter dangerous powers, situations and challenges. In Buddhism the tiger is seen as representative of the spiritual struggle. Since it can orientate its way through the jungle even in darkness, it is seen as a symbol of the inner light. 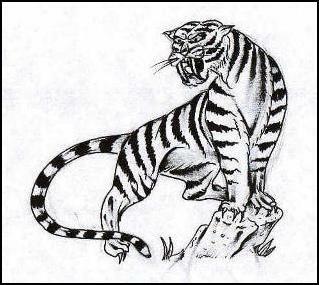 The tiger is the emblem of the royal and warrior castes. It is associated with both Shiva and Durga. 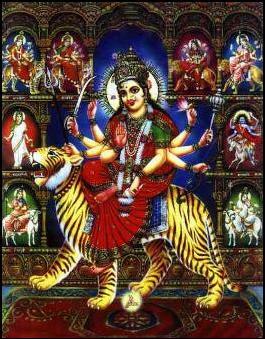 Shiva (The Destroyer) is often depicted wearing a tiger skin, whilst Durga in her destructive aspect rides a tiger. Whilst the tiger is not an animal that is indigenous to Europe, it still creates a powerful image to us here in the west. It has the ability to both fascinate and terrify, even from our safe distance. This mixture of wonder, amazement and fear is well encapsulated in William Blake’s poem The Tyger. The sabre, dao, scimitar, cutlass, the big knife and the broad sword are all various names for either the same weapon or for weapons with similar characteristics. “Whereas the subtle coiling and twisting movements of the double edged sword, take the spirit of the dragon – the sabre with its cutting and slashing qualities has the nature of the tiger” (Chen Zheng Lei). The latter is more athletic whereas the former is perhaps more aesthetic. The straight sword is often considered to be the weapon of high officials and scholars, and there are many legends of such swords forged in other worlds and with magical qualities (just as the dragon, has magical and mythical attributes). In contrast, the sabre is seen as the weapon of the farmer and the ordinary soldier. Rarely is this type of weapon seen as possessing magical powers. It is altogether more earthly in its nature (just as the tiger represents very physical qualities). The straight shape of the double-edged sword ties in with its solar associations being likened to the penetrating rays of the sun. The curved shape of the sabre reflects the lunar nature of the crescent and the rapidly changing movements of double sabres reflect ever changing lunar phases. A parallel is often drawn between sword skills and calligraphy / artwork. In contrast, the sabre is associated with more physical manual work. Staffs are often a symbol of wisdom, journeying and the humble man, whether it is the wand of the magician, the staff of the traveller or the crook of the shepherd. It is also connected with powers of transformation and pilgrimage. In both east and west it is seen as a symbol of the world axis and in western mythology it is an emblem of the centre path and the balancing influence of the Caduceus Staff of Hermes / Mercury around which are intertwined two snakes. Living amongst the trees, swinging from branches and climbing along vines, it is probably no surprise that Monkey is also widely associated with the staff. In ‘A Journey to the West’, we are told of how Monkey came to get his staff. In search of a weapon that was befitting of his character, he went to the Palace of the Dragon King under the Eastern Ocean. The Dragon King welcomed him and agreed to show Monkey weapons from his vast treasury. One by one Monkey tried out the weapons, but felt that none were quite right for him. One weapon, with which the Dragon King did not really want to part, was then brought before Monkey. This was an iron rod that was used to pound flat the Milky Way and it was so heavy that it needed several servants just to carry it. The Dragon King thought that there was no way that Monkey could pick this up, but he did not account for the magical skills that Monkey had acquired. In fact, the iron rod seemed to fit Monkey’s hand perfectly and he was able to manipulate it with great skill. Not only that, he could change its size; he could make it as small as a matchstick that could be carried behind his ear, or at will, he could transform it back into a staff. And so Monkey left the Dragon King’s Palace with the weapon that would accompany him throughout his travels and adventures and become one of his trademarks. Probably, more than any other creature, it is easy to see the links between the nature of monkey and human nature. He can be: charming, crafty, inquisitive, impudent, greedy, grasping, both magician and clown. In fact, in China, the white monkey is often taken to mean us - humankind. In Chinese martial arts, there are styles based specifically on monkey style movements. Monkey Boxing (Houquan), utilises many unorthodox and playful movements as well as much tumbling, jumping, rolling, plucking, parrying and grasping. Drunken Monkey Style becomes even more unpredictable and comical yet still with the potential to be deadly. This style makes manifest the martial adage: ‘when capable, appear incapable – when incapable, appear capable’. 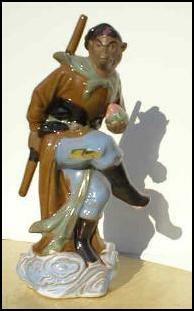 Various other styles incorporate some element of monkey inspired movement. In Tai Chi, there is the movement Step Back and Repulse Monkey. Gerda Geddes relates this symbolically to the idea of freeing the mind from distracting thoughts which the Chinese refer to as ‘monkey thoughts’. A favourite topic in Peking Opera performances are the exploits of Sun Wu Kung – The Monkey King. Operas feature such adventures as: ‘monkey causes havoc in hell’, ‘monkey causes havoc in heaven’, and ‘monkey causes havoc in the palace of the dragon king’. In fact he seems to cause havoc wherever he goes. He is mischievous, unpredictable and disconcerting, yet at the same time immensely likeable. 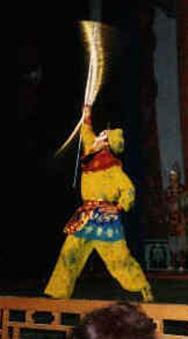 To play the role of monkey, the performer must not only have great acting skills, but also must be an agile acrobat and possess high martial ability, in particular with his favourite weapon – the staff. Wu Ch’eng-en’s book ‘A Journey to the West’ was written in the 16th Century and the stories within it have become a part of Chinese folklore. It follows the adventures of Monkey from his birth as the Stone Monkey, his ascension to Monkey King, his imprisonment in Monkey Mountain and his release to act as a guide and a guard to the monk Tripitaka. This involves a perilous journey to India, which aims to bring back the Buddhist teachings to China. The motley crew of Tripitaka, Monkey, Sandy and Pigsy, manage to survive encounters with a bizarre cast of demons, spirits, gods and bodhisattvas. They return to China with the scriptures and through his endeavours Monkey becomes enlightened and is made into the Monkey God. As well as being a great adventure story, the tale is also an allegorical one where Monkey represents human failings that can be transformed through self-development. He overcomes the ‘monkey mind’ as well as many demons, inner and outer. Probably, the Indian Monkey God – Hanuman who features in The Ramayana, influenced the story of Monkey – A Journey to the West. Hanuman, who was a son of the wind, used his magic powers to help Rama to rescue his wife Sita who had been abducted by the demon Ravana. When Ravana sends fire against him, Hanuman is able to tame it, showing the power to transform even the fiercest of emotions into spiritual energy. 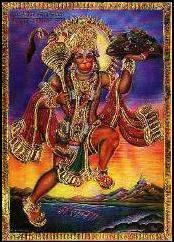 In Indian mythology, Hanuman is considered to be the perfect servant of God. Notice also, the similarity between the name Hanuman and the word human. The monkey is also one of the 12 astrological animals of the Chinese zodiac. In the Far East the 3 wise monkeys of ‘Hear no evil, See no evil, Speak no evil’ are widely known. This has parallels in the Latin Freemason motto: ‘Audi, Vide, Tace’, meaning ‘hear, see, keep silent’.